Update: This post is almost 3 years old. I’ve since updated the Innovator’s Canvas from version 1 in this article to version 3. See my most recent canvas and post here. In this post I would like to share with you the single most powerful new business planning tool I have ever created and used. It’s called the Innovator’s Canvas and it helps both entrepreneurs and intra-prenueurs systematically think through and validate or invalidate their new innovation ideas and business model assumptions. Whatever you’re new idea is, this process can help fill in the details and quickly and cheaply tell you if you’re on the right track or not. In many ways it’s the business plan of the future. Back in the 90’s and early 2000’s, creating huge business plans was all the rage. Endless presentation files and books of up to 100 or more pages used to be commonplace in documenting and describing a new business idea. All this effort was done to please investors who wanted to know what “the plan” was before they made a big investment in a startup. Trouble is most of it was hogwash. Precious time and paper was wasted on trying to define every detail of a business idea that would inevitably require monthly, if not weekly, changes and course corrections as assumptions behind the business plan were destroyed by the wrath of the open market. But because so much time and thought had gone into a 100+ page business plan, entrepreneurs would become fixated on the idea that “if I just execute the plan it will all work out.” After all they did spend a lot of time on their plan, it must be right! Right? Unfortunately no; in fact the opposite became true: the more time you spent thinking and documenting details of your plan, the less right that plan became. But you still needed a plan. No investor worth his salt would ever invest in a startup that had no plan. And no entrepreneur would succeed without at least a basic plan in place. Fortunately there was a better way. In 2008 Alexander Osterwalder, a Swiss business theorist and PhD in management information systems, published a breakthrough single page update to the process of creating a business plan and called it the “Business Model Canvas.” This document helped dramatically simplify and focus the process of creating a business plan to documenting the essential elements on to one single page. These elements were: value proposition, customers, channels, relationships, partnerships, activities, resources, costs and revenues. He proposed that creating a business plan essentially become filling out nine boxes of assumptions on a single piece of paper. 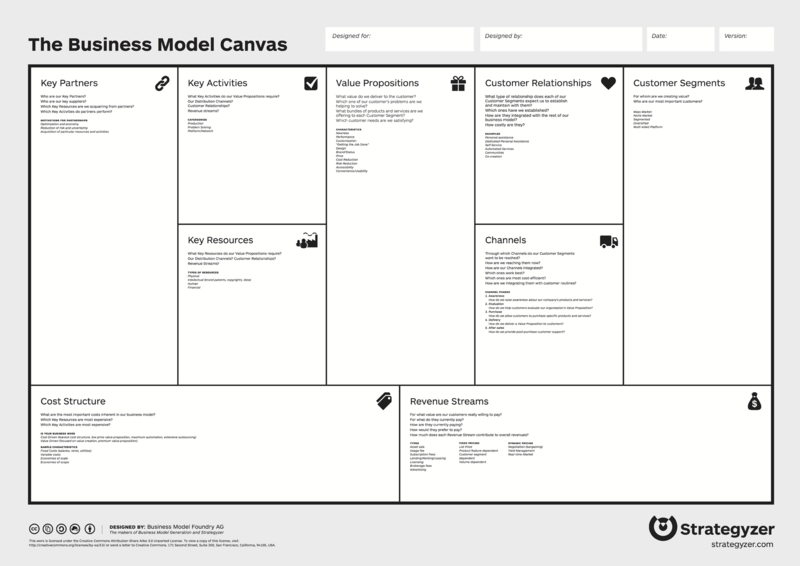 The Business Model Canvas became the answer to the 100+ page business plan. Business Model Canvas: nine business model building blocks, Osterwalder, Pigneur & al. Thanks to the dramatically simpler format and the categorization of the essential elements of a business plan, the Business Model Canvas was well received and has become a staple in the startup and new business development world. Osterwalder (et al) didn’t stop there, in 2014 they released an update to the business model canvas by providing more detail about the customer and value proposition sections by creating the Value Proposition Canvas. This new canvas provided a simplified way to think through the heart of the business model. Combined these two canvases provided a strong foundational framework for thinking through your new business opportunity. But as great as it was, it was only helpful from a thought process/documentation perspective. In other words, by itself it was not able to answer the fundamental question of every new business: are the assumptions you have right or not? To answer those hard questions, Steve Blank, a famous investor and professor at UC Berkeley had been working on a process called the Lean Startup that startups could utilize to validate or invalidate their business model assumptions. In 2004 he invested in a startup led by Eric Ries who enrolled in his course at UC Berkeley. For Ries this provided a mentoring experience that ultimately led to him writing the international best-seller “The Lean Startup.” Shortly after the book was released Steve Blank wrote an article in the Harvard Business Review titled “Why The Lean Startup Changes Everything” where he explained the concept. I highly recommend reading it if you haven’t already. These Lean Startup principles formed the foundation of a revolutionary change in the way startups create and validate new ventures. But despite the usefulness of the principles, entrepreneurs and investors still needed a way to track their progress towards building a repeatable and sustainable business model. That’s when Steve Blank came up with what basically amounts to a business model scoreboard. Taking a page from NASA’s approach to technology readiness levels, Blank created what he calls “Investment Readiness Levels.” He wrote a blog post about it here. Below are his levels on the left and my interpretation of them on the right. With this tool both investors and entrepreneurs could easily see what the major milestones are in the creation of a new business and where they are along that spectrum. The combination of these tools has proven highly valuable among startups and big businesses looking to build new product lines or business models. But as I used them in my innovation efforts I found them to be lacking a couple essential elements and characteristics. 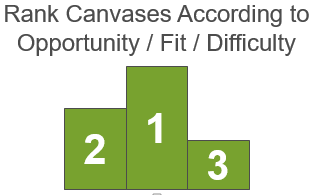 I felt as if both the investment readiness levels, the business model canvas and value proposition canvas were 80% complete, almost like an MVP, and nobody had bothered to put them all together into a finished product. That’s when I decided to create The Innovators Canvas. 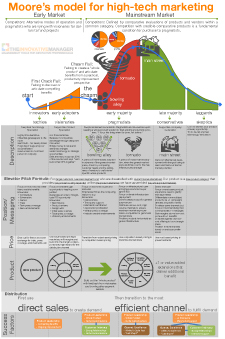 The goal of the Innovator’s Canvas is not just to provide a canvas template but to provide a systematic process by which business models can be documented, tested and iteratively created until you have achieved either fast/cheap failure or certain success. Ultimately those are the two best outcomes any entrepreneur (or intrapreneur) can expect. 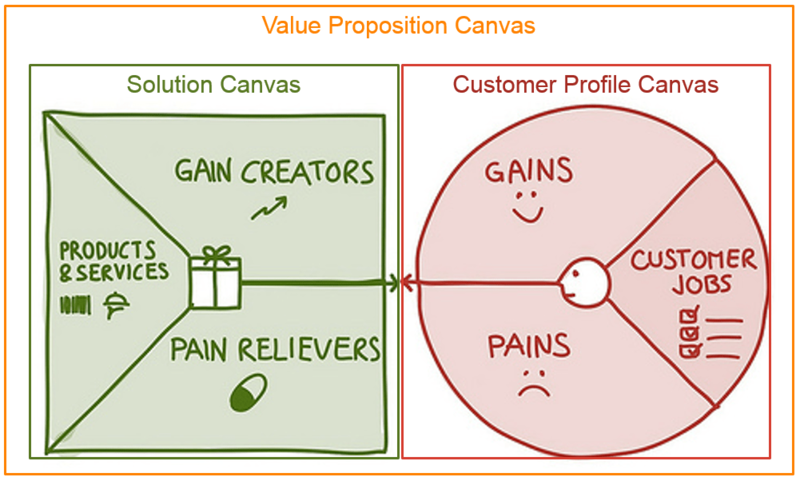 The first thing I didn’t like in using Osterwalder’s two canvases, the business model canvas and the value proposition canvas, is that there were two of them to begin with. From a practical standpoint I found that combining those two canvases into one was a logical first step. The key activities box was unnecessary – especially when these two were combined. In 2014 I was exposed to the Lean Canvas by Ash Maurya in which he made two additions that seemed helpful: 1) Unfair Advantage and 2) Key Metrics. He made other changes that I didn’t find as useful but these two additions were very helpful. Even with these changes, I still found the resulting canvas to be lacking something essential. It felt like the “what” and “how” of each business idea was captured but not the “why”. In a blog post on the Apple Watch I discussed the importance of why and linked to a TED talk by Simon Sinek. If you haven’t seen that post you can check it out here. Having identified this as the missing piece of the puzzle I decided to add it as the top center item just above value proposition. No business idea should ever be seriously considered unless you have a compelling why behind it. With this as the template I used in developing new lines of business I quickly found that the typical format of saving this as a pdf and using sticky notes to document each cell was not going to work. Sticky notes are a great tool to use initially but I didn’t want to worry about sticky notes falling off or not being able to read the sloppy handwriting on them so I created this template from scratch in PowerPoint. After creating the initial blank template the next thing to do was create a thorough explanation of each cell on the canvas. The image below provides these explanations. With the Innovator’s canvas we now have a thorough template for documenting complete business model ideas. If anyone has a business idea that they want to get serious about, the first step is documenting the idea in the form of the Innovator’s Canvas. This forces the individual or team to think through each of the essential elements of the idea and begin to “put meat on the bone” so to speak. But just having documentation of the idea is merely the first step toward true business model validation. In my experience ideas tend to be a dime a dozen. Many people at some point have had an idea that they loved and yearned to pursue. Some even have a number of ideas jumbling around in their mind that they have always thought would make a great business. Having a lot of ideas is great but to make any progress one needs to know where to start. That’s why every new business model idea needs to be ranked and validated or invalidated as quickly and cheaply as possible. How big of an opportunity from a market size and revenue standpoint is this business model? How well does it fit within the core values and capabilities of the founding team or sponsor organization? How difficult will it be to build, grow and sustain this business model idea? The answers don’t need to be exact and there are no firm thresholds to meet when doing this (unless you want to establish firm thresholds) but the idea is to create a quick relative ranking of each business model idea so you know where to focus your efforts. Once you’ve thought through those questions and arrived at a ranking of business model ideas the next step is validation of those ideas. 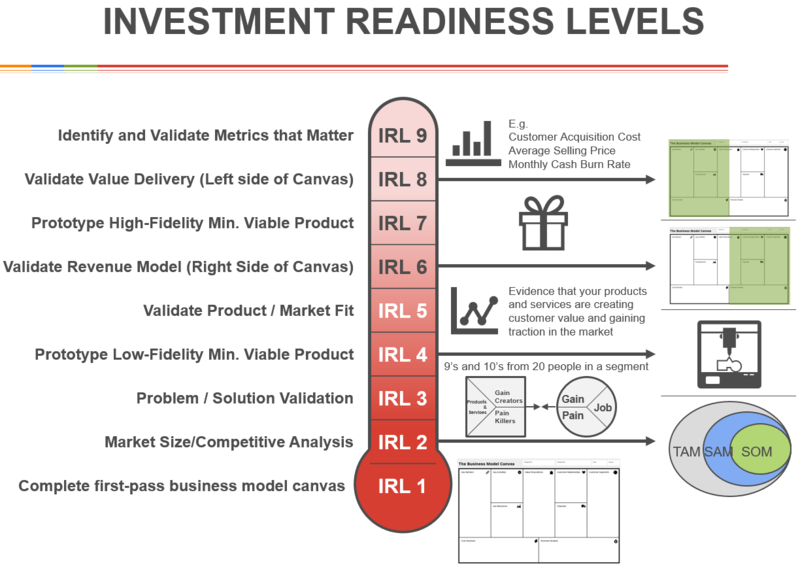 One other way to help facilitate validation, especially in situations when business model ideas are competing with each other, I’ve modified Steve Blanks Investment Readiness Levels by turning them on the side and adding the critical step of defining a “why.” The result is essentially a business model scoreboard. Notice how this scoreboard also has three general phases that line up with the three general regions of the business model canvas. Shade red if the stage has been attempted in a serious and deliberate manner but for various reasons the criteria is not being met. This is a signal that you may need to pivot from that business model into another. Customer / Market / Competitive Analysis: You have done an initial customer, market and competitive analysis on the idea and have shown that the idea has promise of meeting customer needs, has a market size that meets or exceeds your targets and does not pose a substantial competitive threat or barrier to entry. Problem / Solution Fit Test: You have discussed the idea with potential customers and at least 6-8 B2B customers or 15-20 B2C customers within a defined segment have said that the solution solves a compelling pain point and they would buy it right now if it were available. The Why: You have defined a clear and emotionally compelling “Why” behind the business model idea. MVP Test: You have created an MVP (defined as the smallest test you can devise to try out a specific idea or hypothesis – usually not an actual product but rather some form of simulation or prototype) and tested it with potential customers. Product Market Fit: You have sold the product or service through a sustainable channel and the solution is starting to gain meaningful traction in the market. Right Side of the Canvas: You have validated the value proposition, channel, customer segment with pains/gains/jobs, ongoing customer relationship model and the revenue stream. You may not have a profitable business yet but you do have a business that is generating revenue and creating value for customers. Product Vision: You have clearly defined the end-state of the product work representing all target personas, vertical markets and/or geographies. Left Side of the Canvas: Your business has validated its cost assumptions, developed essential partnerships, established a credible unfair advantage and leveraged your key resources. In short the business is now profitable and sustainable but may or may not yet be scaled. Metric that Matters: You have identified the leading metrics that predict the outcome of the lagging metrics. You focus your efforts on moving those leading metrics in order to scale or further optimize the business. As you get into doing this for your own startup or organization a few rules are essential to this process working properly. Team goal: Identify 6-8 B2B or 15-20 B2C “Earlyvangelist” customers. These are customers who care disproportionately about the problem to be solved and are willing to work closely with the team throughout the discovery process to ensure the product or idea is done right. The teams primary day to day duties consist of devising and running experiments. In order to properly run an experiment the product discovery team must document the assumptions before running the experiment and document the results during and after the experiment and either validate or invalidate their assumptions. 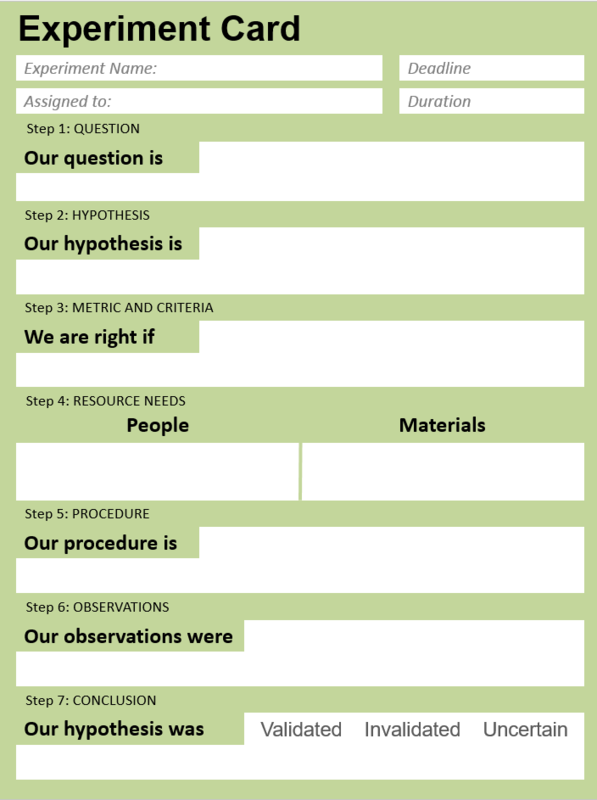 Below is an experiment card I created to help facilitate the process of documenting an experiment. As you design and execute experiments you’ll better understand how to hone in on addressing your target customers needs. Note that the product discovery team, in ideal conditions, should be running at least 2 experiments per week. 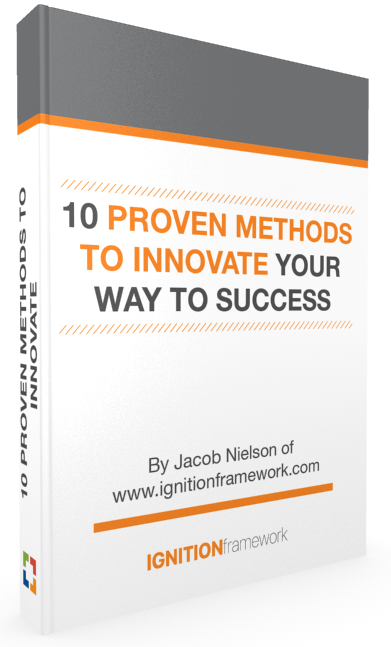 The more high quality experiments you can run the faster you’ll be at climbing the learning curve and achieving business model success. To manage the workflow of experiments and team efforts a daily or 2-3 times per week stand-up meeting can help organize the teams efforts and ensure that the process is being followed. During that stand-up meeting the primary topic should be discussing the results of the previous days/weeks experiments and quick coordination for carrying out the next set of experiments. As you get more familiar with this process you’ll start to discover the power of framing it in this way. Ultimately the value of it is that it serves as a living business plan document and scoreboard that is updated frequently and shows you whether you are on track or not. For a PowerPoint version of these documents, visit this link. 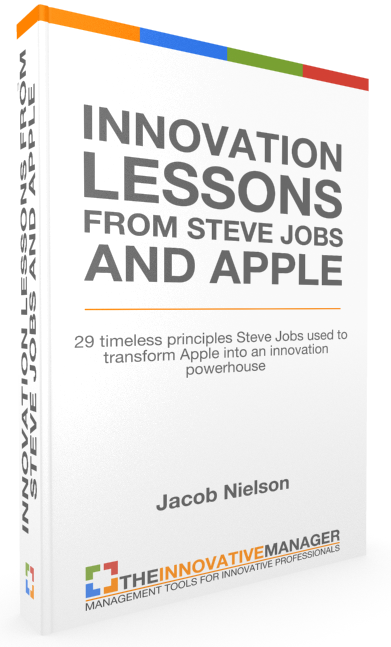 One Response to "The Innovator’s Canvas: A Step-by-Step Guide to Business Model Innovation"